This extra-long installment of the Star Log-series clocks in at 14 pages, 1 page front cover, 1 page editorial, 3.5 pages of SRD, leaving us with 8.5 pages of content, so let’s take a look! Okay, this one is something completely different. 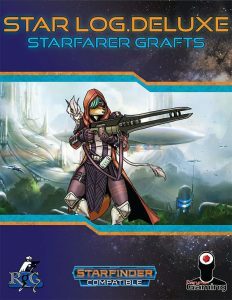 Everyman Gaming and Rogue Genius Games have been at the vanguard of Starfinder content from the get-go; the massive Starfarer’s Companion book would be one such example. Now, here’s the thing – quite a lot of the releases of the companies managed to predate the Alien Archive, which means that NPC/Monster-creation couldn’t be taken into account. Well, this book remedies that for quite a wide variety of different sources. To be more precise: We get the creature subtype grafts for the Starfarer’s Companion races, as well as for the Skinwalkers, gnolls, ganzi and msvokas introduced in the Star Log.EM-series. The traits are concisely codified and leave nothing to be desired, with level-dependent feat effects etc. accounted for. The pdf also does feature class grafts, and this section does include the legacy classes pioneered in the Starfarer’s Companion and the stand-alone Witch Legacy class. I am not particularly fond of these legacy classes, but plenty of folks are; plus, balance concerns are less important for the creation of potent adversaries, so yeah. The presentation of these class grafts is concise and precise; Skill, ability score modifiers, required array – all precisely presented. Per class, we do get more than 10 ability-by-Cr-entries in respective tables; how many do depend on the class. Some get 14 entries, some just 11. Perhaps that’s just me being greedy or, well, kinda OCD, but getting those for all CRs would have been nice, if only for completion’s sake. Nice: Regarding gear, e.g. paladins and rangers get separate entries for melee or ranged focus, though oddly, formatting isn’t consistent here. For the ranger, the headers are italicized for the gear sub-focuses, while, for the paladin, they’re bolded. That is just a cosmetic hiccup, though. A neat plus, at least for me, was the inclusion of the Zoomer-class pioneered by Everyman Gaming in the array. The Aeoncarnate base class is similarly included, but I do not own this particular class, so unfortunately, I can’t comment on the virtue of its implementation. Editing and formatting are very good; apart from cosmetic, minor snafus, I encountered no issues. Layout adheres to the two-column full-color standard of the series and the pdf does have a nice artwork. The pdf has no bookmarks, which usually isn’t a problem for files of this size, but considering the reference-character of this pdf, it is a bit of a pity. I’d advise you to print out the file and add it to your Alien Archive. This is one of the pdfs that just screams “I have been a mindnumbing labor to make” to me, and I’m glad that Alexander Augunas sat down and did all the work that assembling these must have been. And don’t get me wrong: The like *IS* work. Take it from my own design experience. Heck, even reviewing this took MUCH longer than the brevity of this review would make you believe. Flip open all those pdfs, check…you get the idea. In short: This is an incredibly handy little pdf if you’re looking for the graft-information for all these aforementioned books supported within. It is definitely worth getting, particularly if you’re like me and this type of work sends you into a GM-ing-procrastination spiral. So yeah, this is USEFUL. That’s its focus, and it delivers. 5 stars. You can get this handy pdf here on OBS! The skinwalker race is here! The Starfinder gnoll can be found here! The ganzi race is here. The fantastic Msvoka-race can be found here! The Zoomer base class can be found here! You can get the Starfarer’s Companion here! The Witch legacy class can be found here. The Aeoncarnate class can be found here.